For the fifth year running, local web enthusiasts will have the opportunity to showcase their talents in the Seychelles Webcup 2018 and with it, the opportunity to represent Seychelles in the finals that will be held in one of the participating countries later in the year. 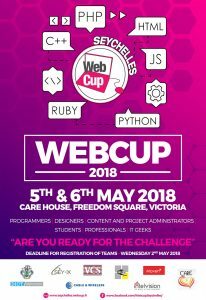 This year’s preliminary round competition is being organized by SEY-IX (Seychelles Internet Exchange Point Association) in collaboration with the Webcup Association of Reunion and will be held at the CARE House, Freedom Square over a 24-hour period from 1200hrs on Saturday 5th to 1200hrs on Sunday 6th May 2018. “We are therefore urging all web enthusiasts to come forward yet again and make this event a bigger success, because apart from winning some exciting prizes that are sponsored by our loyal sponsors, the winning team will get to represent Seychelles in the Grand Regional Final and it’s not every day that one has the opportunity to represent his or her country in an international competition.” said Mr. Gilbert Lebon, Chairman for SEY-IX. “We also want to point out that if you are interested in participating but cannot put a team together, we can then put you in contact with other individuals that have expressed an interest to participate. Webcup is not just a competition but there’s also camaraderie and friendship that comes out of it” added Lebon. The Webcup is an annual event that was first introduced in 2010 by the Webcup Association based in Reunion Island, with the aim of promoting Information Communications Technology (ICT) around a fun and educational event; with the participants working as individuals or in teams of not more than 4 persons (amateurs, students and professionals are all welcome – minimum age requirements of 16 years) who must within 24 hours (non-stop) develop a website on a topic kept secret until the start of the competition. The preliminary round is held simultaneously in Reunion, Mauritius, Seychelles, Comoros, Mayotte, Rodrigues, Madagascar and for the very first time we welcome Burkina Faso; proof that the competition itself is growing and now covering mainland Africa. Mr. Lebon also expressed his appreciation towards the sponsors that have come forward once again to support the event. “We are thankful to our loyal sponsors, the Department of Information Communications Technology (DICT), Cable & Wireless, Intelvision, VCS, Wi-fi Plus, Maven and CARE (Campaign for Awareness Resilience & Education against Substance Abuse) for their valuable contribution because without their continued support, the event itself would not have been possible. Register your team now to participate in the Seychelles Webcup 2018!